I'm the featured "Flasher" over at The Indie Exchange today where I introduce you to my precious Charlie. I have been wracking my brain all week to think of books about dogs. But as I mentioned in my World Animal Day post, I tend to shy away from books about animals. I came up with three books that I've read since I started blogging that a dog played an important role. I read the children's book Buddy's Tail by K. Anne Russell (see my review). It wasn't too sad. There is a bit of saddness - my niece tried to read it and thought it was too sad. The other two is part of a series: Confessions of a Slightly Neurotic Hitwoman (see my review) and Further Confessions of a Slightly Neurotic Hitwoman (see my review), both books are by J. B. Lynn. I talked a lot about the second book on World Animal Day because the dog has a much bigger role in the second book. So those are my dog books. But when trying to think of titles, mostly I came up with TV or movies. I loved watching Lassie and have watched some Clifford the Big Red Dog. Old Yeller was very sad, but I think I watched it every time it came on TV (Benji movies were the same way - I wanted a Benji dog). Maybe I just don't become as attached to animals that I see on the screen as I do on the page. What dog books have you read/enjoyed? 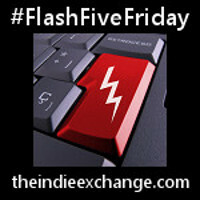 See more Flash Five Friday posts here. Hey Donna, I enjoyed reading this week's post and can relate to your reading preferences. I too normally don't read stories with animal characters, but recently read one from one of TIE's regular contributors. I'm sure you know Vickie an you've probably read "3 Heads & A Tail." If you haven't read it yet, you'll thank me later. It is a quick fun read. I just wanted to plug it here because of the other titles you mentioned. David keeps saying I must read The Plague Dogs but I'm worried I'll cry my heart out. I've started it twice and struggled. I recently read 3 Heads and a Tail by Vickie J and loved it. Love the dog pics this week! I'm glad you like Doomsday so much. She's one of my favorite characters to write! When I was a kid I loved The Incredible Journey. Have you read Garth Stein's The Art of Racing in the Rain? It's told from the POV of a dog. And the James Herriot books are great for quick doses of animal stories.